The Next Big Total Solar Eclipse In North America Is In Less Than 2 Months From Now! Home » alaska » bahamas » canada » carribean sea » cuba » earth » holidays » mexico » north america » solar eclipse » usa » The Next Big Total Solar Eclipse In North America Is In Less Than 2 Months From Now! People from all over the world are getting ready for the greatest astronomical event that will take place in North America in almost 40 years. On Monday, August 21, 2017, a total solar eclipse will sweep across the United States, which will darken the skies from the West coast all the way to the East coast. Evry sky watcher, sun chaser, moon gazer, astronomer, and basically about everyone else will be eager to get a chance to witness this rare and amazing celestial event! The 2017 eclipse is called the "Great American Total Solar Eclipse" and countless people are very excited for this one, while some have even been holding on for decades to see it. If you want to enjoy the most of the mid-August eclipse, you should plan ahead first and learn all about what to expect from this unique experience. During a total solar eclipse, the moon seems like it entirely covers the sun. With the sunlight hidden and prevented from reaching Earth, the day unexpectedly becomes night and darkness falls upon many parts of the Earth. This phenomenon happens when the moon is between the sun and Earth, and like all solar eclipses, this occurs during a new moon. Additionally, the alignment of the sun, moon, and Earth means that they are aligned both straight and evenly. Since the moon's orbit is slightly tilted and elliptical, instead of circular and on an even orbital plane to the one of the Earth, its shadow at new moon almost always misses Earth. Nevertheless, when the new moon is at a place in its orbit where it's close enough to seem just as big as the sun is, a total solar eclipse can occur. However, to view it here on Earth, someone needs to be in what is called 'the path of totality.' That's where the moon's shadow tracks along on the Earth's surface below as it sweeps across the sun. Also, it's where there's the best and darkest view as the sun is completely blocked out by the moon! For this upcoming American total solar eclipse, the path of totality happens to pass amazingly across several states in a narrow arc that will be almost 75 miles wide. It begins on the Pacific Northwest coast of Oregon and goes over and down on a southeasterly curve crossing over parts of Idaho, Wyoming, Nebraska, Kansas, Missouri, Illinois, Kentucky, Tennessee, North Carolina, and Georgia, before completing in South Carolina. Around 12 million people live in the narrow path of totality and a further 220 million live within a one-day drive of it, according to Space.com and skywatching columnist Joe Rao. 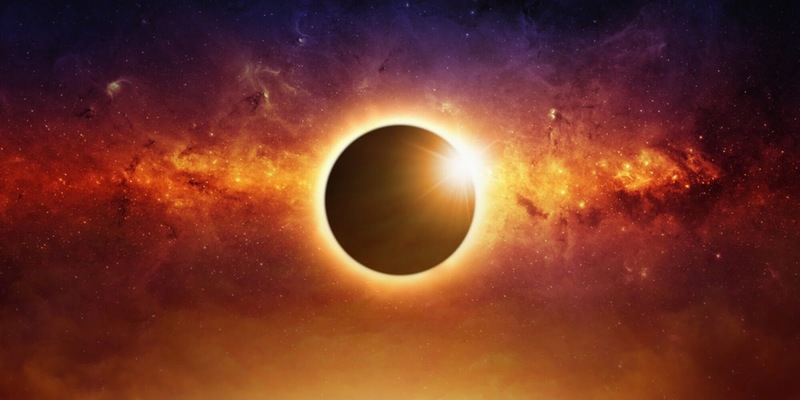 Those who are lucky enough to view the eclipse in the path of totality will have something between a few seconds and 2 minutes and 44 seconds of it, that is the longest period of totality according to the US Naval Observatory. The exact spot with the greatest duration is somewhere in the Shawnee National Forest in Southern Illinois. Sure enough, all views of the eclipse hinge on two significant factors; weather and eye protection. Proper eyewear is crucial for anyone who plans on watching at the eclipse. You should only look at it with special solar viewing glasses. Sunglasses, even layering several pairs of them, won't provide enough protection and, also, don't even think about using binoculars! Since the sun is partly hidden by the moon, people find it easy to look and stare at, but that's not true! It's even more dangerous than looking at the sun on a typical day. We've all heard the warnings and scary stories about how someone went blind during a solar eclipse, and even though it might sound exaggerated, the risk exists. Looking directly at the sun's photosphere, the shiny disc, even for some seconds can and will result in damage to our sensitive eyes. That's why you should buy a pair of specially designed eclipse glasses which filter the sun. You can easily find them online, and they're not expensive. You should wear those glasses for the whole duration of the eclipse. The only truly safe moment to look directly at the sun is during the short window of totality when it's totally hidden by the moon. Now that you've found out all you need to know about the August 2017 solar eclipse you can put it in your calendar and anticipate for an astronomically cool event! Be ready, plan ahead, and make sure to check out the eclipse maps to find out more specific details.